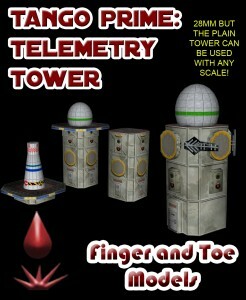 Finger and Toe expands their Tango Prime sci-fi line of terrain with their new Telemetry Tower pdf piece. Finger and Toe Models announces release of the 28mm PDF Tango Prime: Telemetry Tower. It’s a modular science fiction standalone tower or can be incorporated into existing structures from the Outpost set. Two versions of the tower are included. One is fully textured for a quick build. The other is a plain tower that accepts the included 3D appliques to customize the tower to your needs. Also included are a long range navigation beacon and a radome. The platform at the tower’s top can be used as a standalone piece. For taller towers, Telemetry Tower is designed to be stackable. A basic tower fits a 3"x3" footprint and stands 6" high. Further, since the plain tower has no texture elements, it can be used with any scale. Telemetry Tower is textured to fit in with all the other Tango Prime products, such as the Outpost, Comm Array, Guns of Pavarone, or Flak Tower.